Kevin Hartman was drafted 29th overall in the 1997 MLS draft by the Los Angeles Galaxy and all he’s done since that time is set every major statistical record for goalkeepers in MLS history! Named MLS Goalkeeper of the Year in 1999, Hartman helped the Galaxy win the US Open Cup in 2001 and 2005 and the MLS Cup in 2002 and 2005. The two-time MLS champion played alongside such icons as Landon Donovan and Cobi Jones and helped the Galaxy to become one of the storied franchises in the MLS. After ten years with the Galaxy, Hartman was traded to the Kansas City Wizards following the 2006 season. Following several years with FC Dallas where “El Gato” continued to set all-time records including wins, games, clean sheets, etc., Kevin is brining his legendary career to New York as a member of the Red Bulls. On June 4, 2011, Hartman became the first goalkeeper in MLS history to record 100 clean sheets while playing in over 400 MLS games! The undisputed future Hall of Fame Goalkeeper is just as successful off the pitch and along with numerous charitable causes and corporate partnerships, Hartman is also a published author. After concluding his stellar career, Kevin has moved up to the broadcast booth to serve as the color commentator for FC Dallas. The multitalented athlete is married to his lovely wife Jennifer and along with his two daughters, “El Gato” remains one of the all-time favorite MLS players and American soccer icon. MLS legend Kevin Hartman engaged fans Friday evening at 5pm PST and he discussed everything from his career to the World Cup. 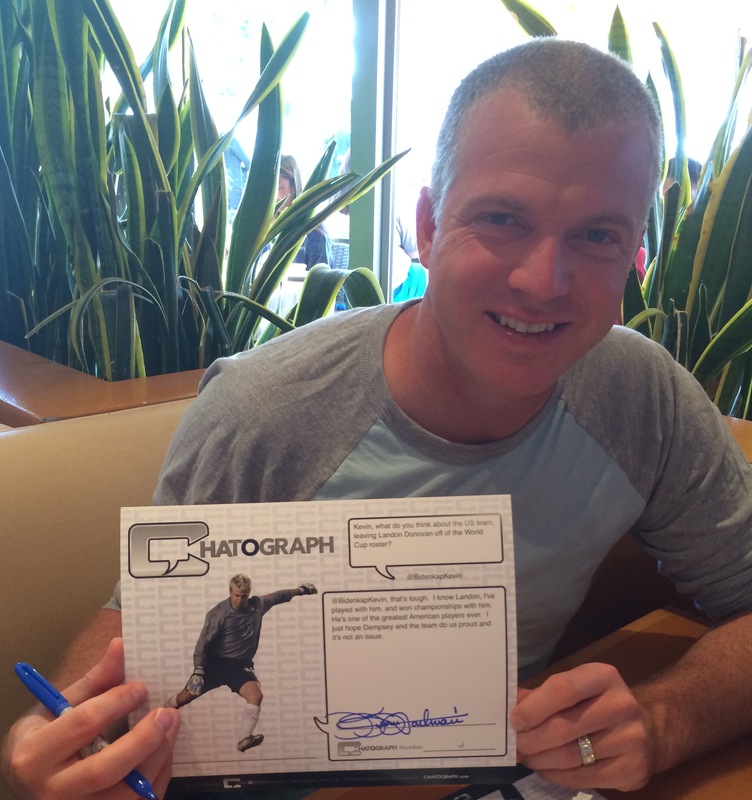 Hartman then signed the CHATOGRAPH transcript certificates for a one-of-a-kind celebrity engagement for fans! @RandyRovegno: @KevinEHartman, what would be the highlight of your career?Was it the MLS Cup?Playing on the US team?Setting the all-time saves record? Zach: @KevinEHartman I attended your goalie camp in PV and you were a great coach! Bean: @KevinEHartman, What advice would you give me as a young goalie? @KevinEHartman: Bean, I think you need to hang in there. It’s a position you learn through experience. And some of that includes pulling the ball out of the net. But there’s nothing like the excitement of making a save so keep at it. Dillan: @KevinEHartman Kevin, what players do you have the most respect for? @KevinEHartman: Dillan, I grew up watching Peter Schemeichel of Man U. Always had a soft spot for Americans like Friedel and Howard as well. Carldiorio: @KevinEHartman Which World Cup goalkeepers have exceled and who has disappointed? @bobhorn90: @KevinEHartman Was Ochoa’s game for Mexico the best goalkeeping performance you’ve ever seen? @KevinEHartman: @bobhorn90 I’d say it was up there. Maybe not the greatest single performance. I’d go with the heroics of Kasey Keller versus Brazil. @jtbojanglesxxxl: @KevinEHartman As a fellow Pac-12 alum, what do you think of the level of soccer that your Bruins and others play in the conference? @Bidenkapkevin: @KevinEHartman what do you think about the US team leaving Landon Donovan off of the World Cup roster? @KevinEHartman: @Bidenkapkevin, that’s tough. I know Landon, I’ve played with him, and won championships with him. He’s one of the greatest American players ever. I just hope Dempsey and the team do us proud and it’s not an issue. @KevinEHartman: @MohrTennis, I’d play golf! I enjoy playing and I like the resorts. Plus the course design and the strategy behind development is cool.